Which sects or schools reject Nagarjuna's metaphysics? On what grounds do they do so? How do they deal with the difficulty that Nagarjuna proves all theories of Reality except his own are logically indefensible? There are three issues here: there is N's proof of the absurdity of all positive metaphysical positions (in Fundamental Wisdom); his 'theory of Emptiness'; the doctrine of 'Two Truths'. I wonder whether some Buddhists cherry-pick from these -- or do those who reject or accept one of them tend to reject or accept all three? The statement by the Buddha that he did not hide anything in a closed fist. Basically, this means that from the perspective of the Theravada school, everything that the Buddha had taught in the Pali Canon is sufficient. Nothing more is needed. Anything else is simply icing on the cake. Personally, I have tried to understand Nagarjuna's Madhyamaka emptiness and tried to link it back to Theravada emptiness in this question. I appreciate the concept of Madhyamaka emptiness. I don't think Nagarjuna is in conflict with the Buddha's original teachings (in the Pali suttas and Mahayana Agamas). But at the same, I don't think he introduced something new to improve the Buddha's original teachings. One important contribution of Nagarjuna is the use of methodical philosophical analysis to defend Buddhism against attacks by Hindu and other non-Buddhist Indian philosophers. See this answer. I don't have the scholarship to give you a survey of several schools -- perhaps someone else will. The way I see it is that schools will have a "canon". I think that's a bit a analogous to the "curriculum" of a school -- and different schools have different curricula ... almost by definition -- and therefore (i.e. to that extent) your question and/or my answer to it might be just trivial, or unsatisfying. Now just consider the Pali canon, for example -- I thinks that's "the canon" for many Buddhists. Trivially if something is in the canon then it's canonical, and if it's not it's not. If you ask, "what makes something canonical? ", then you might get an answer like, Buddhist councils. It's big enough ("approximately eleven times the size of the Christian bible") -- so, honestly, what more could you want? Which sects or schools reject Nagarjuna's metaphysics? On what grounds do they do so? I don't know that they even know or care? I don't know if this is a good analogy, but ... "How can there be people who haven't thoroughly studied Einstein's theories of relativity? How do they even explain the gravitational lensing of light, without it?" -- someone asking these questions might think that Einstein's theories are utterly fundamental to understanding the nature of the universe we live in -- for other people ("normal people", if you'll excuse my putting it that way) that's completely missing the point, quite irrelevant, nothing to even think about. Quite. Well I suppose that Buddhism isn't necessarily "metaphysics". I think I inferred from this comment of yours that you see Taoism too as metaphysics (or what you call a "(perennial) philosophy") -- I don't know, maybe it's something else: practical, a science ... a history, a narrative (see also e.g. "is medicine a 'science', or an 'art'?") ... whereas "metaphysics" are even less relevant, more of a niche interest, than "physics" (if you'll forgive my saying so, that's me having studied physics but not formal philosophy). Practically, I think that the suttas' summary is something like, "all sankharas (n.b. nibbana is a dhamma not a sankhara) are dukkha" -- and "both (i.e. all dhammas, including nibbana and sankharas) are anatta"). 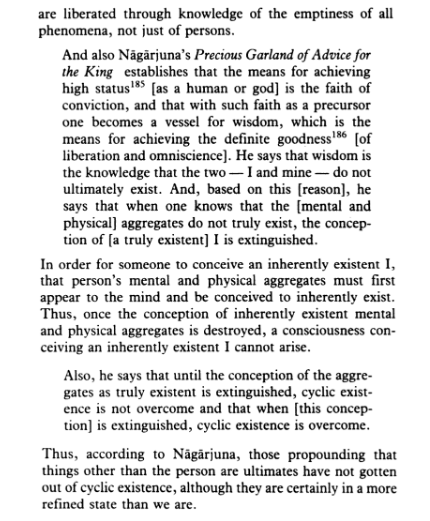 In contrast, I think that (correct me if I'm wrong) N's summary is that "everything (including nibanna) is sunyata". Maybe the suttas aren't trying to be "logically defensible" -- they're trying to be "helpful descriptions" ... for people who have "ears to hear", and "little dust in their eyes". I get from the suttas that the Buddha (and, following his example, some Buddhists) might treat that or any other kind of question as false dichotomy -- e.g., "Q: Is it this or that, or both, or neither? A: none of the above, or no answer." Questions like, I don't know, "Are things empty or not? Are two truths, or only one, or none?" are just -- might be (at the risk of sounding rude) be called -- examples of papanca. I mean, after you have studied -- and if you study -- Nagarjuna, then you may understand what he's saying ... and why he's saying it i.e. why it's helpful or beneficial, useful, practical, worthwhile. Maybe you should know, though, that lots of people simply haven't (studied N that well) and don't (understand what good about it and exactly what he's saying). I guess another example might be the Zen story, titled Nothing exists ... an example of the doctrine being -- variously, I guess, depending on I interpret that story -- hard to fathom, shallowly repeated, easy to misunderstand, or missing the point entirely. Using the term Dependent Origination to describe all "cause & effect" rather than merely restricting the term to the 12 conditions leading to suffering. Equating Dependent Origination with Sunnata, which is wrong, because Nibbana is also Sunnata but Nibbana is not Dependently Originated. Also, for example, in SN 12.3, the Buddha taught Dependent Origination is "the wrong path". Saying things that are contrary to meditative experience and contrary to the Buddha, such as there are really no causes and no effects because a cause is only cause dependent upon an effect to be a cause therefore an effect is the cause of a cause (or something like that). In reality, meditators see certain things giving rise to other things. That is why the Buddha taught there are causes. When in meditation things are seen directly, the THINKING does not occur that a cause is really an effect and an effect is really a cause and the other philosophical Taoist-like intellectual gymnastics of non-duality Nagarjuna engaged in. My impression of his "Two Truths" is his so-called higher truth is "non-thinking" or "non-conceptualisation", which is unrelated to what the Buddha taught. The Buddha did not teach "non-thinking" or "non-conceptualisation" is Nibbana (the supreme state). From what I have read by Mahayana Buddhists, Nagarjuna claimed the Four Noble Truths were a "conventional" or "lower" truth; which a Pali Buddhist cannot accept as true (because MN 117 says the Four Noble Truths are supramundane Right View). Did Nagarjuna teach Nibbana & Samsara are the same? If so, a Pali Buddhist would generally find such an idea to be utterly ridiculous. The Pali suttas clearly say Samsara & Nibbana are totally opposite things. Contrary to Satipatthana, Nagarjuna taught there is emptiness of self and emptiness of things and the "emptiness of the aggregates as things" must occur before liberation can occur. This is contrary to Satipatthana, where seeing the body as merely 'body'', etc, is sufficient for liberation. I prostrate to the Perfect Buddha, the best of teachers, who taught that whatever is dependently arisen is unceasing, unborn, unannihilated, not permanent, not coming, not going, without distinction, without identity, and free from conceptual construction. Not the answer you're looking for? Browse other questions tagged philosophy nagarjuna or ask your own question. Why isn't there a Buddhist Bible? Have any Buddhist thinkers responded to the critique of the Brahma Sutras? Is it wrong to buy a Buddha statue in Thailand from a Buddhist point of view? Which (semi)secret societies influence Buddhism? What is the relevance of Pratityasamutpada in Nagarjunas system? Which book by Nagarjuna provides an introduction to his teachings? What is the meaning and/or purpose of life? Which commentary on the MMK should be studied first?